The illustrator shares the pens she uses to create her sketchnotes. Looking at the best illustration tools and best art tools used by top pros can help artists to learn how to draw and paint their own masterpieces. And if there's one thing creatives are mad-keen on, it's the tools of their trade. Finding out about new pens and papers, brushes and paints can be the eureka moment for artists who have been struggling for ages to capture the right look with the wrong tools. 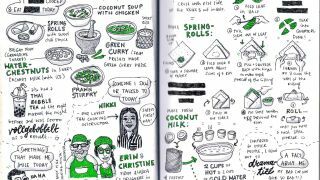 To this end, we've caught up with designer, illustrator and visual thinker Eva-Lotta Lamm to see how she creates her characterful and popular sketch notes. Her main insight might come as a surprise to artists who like to blame their bad art on insufficient tools. "I always tell people, that 'Any pen is better than no pen,'" says Lamm. "The magic is not in the tool, but in the practised hand. But if you sketch a lot, of course you develop some preferences for certain tools." With this in mind, Lamm has shared some of her favourite pens for sketching. The top tool in Lamm's pen pantheon is the Pilot Hi-Tec-C 0.4. She describes this super-thin pen as being "lovely for small writing and line drawings." Thanks to its slightly scratchy feel on paper, this pen has also won the coveted position of being Lamm's absolute favourite tool for sketchnoting. When it comes to working for a large format, Lamm tends to shun big names like Sharpie and Copic in favour of Neuland markers. These have the advantage of not having a strong smell that can make you dizzy, plus they come in over 20 colours – handy if you need to create vibrant artwork like Lamm's sketchnotes. For playing around with calligraphy and lettering, one of Lamm's preferred tools is the Pilot Parallel pen. With four different nib widths ranging from 1.5mm to 6.0mm, it's no surprise that this refillable broad nib calligraphy pen is a popular choice when it comes to writing. Her main insight might come as a surprise to artists who like to blame their bad art on insufficient tools. "I always tell people, that 'Any pen is better than no pen,'" says Lamm. "The magic is not in the tool, but in the practised hand." If these tools have piqued your interest, or if you want to see which ones are a no-go, head over to Lamm's blog where she's put together a complete list of her favourite pens.